Have you heard? Archaeology came to town. Go see the archaeology! This game was made for the March 2018 Bitsy Jam: Archaeology. 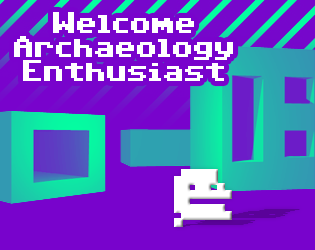 I love your different approach to the whole archaeology theme! Thanks to this bizarre game environment, it felt kind of out of space to collect the different artifacts, because how should I make sense of them when I'm trapped in a deep hole with Submarine-Tea-Running-Ian? ;> That was an absolute delight, thank you! I included this entry in our compilation article about this Bitsy Jam along with three other games, and it's also featured in the showcase video. :) Hopefully it might drive more players to you! Great, very original environmental art style. Well done! Wow! The artwork in this is phenomenal, especially the fun-house!